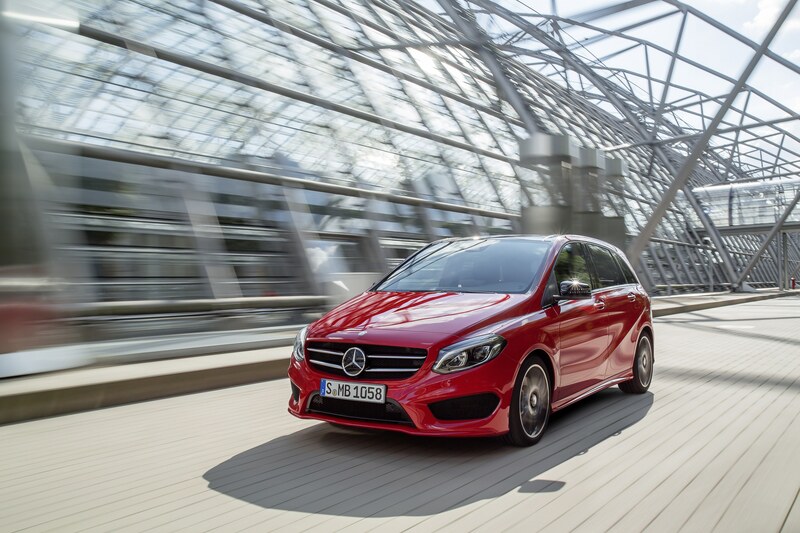 This is the new Mercedes B-Class which the firm says is ‘a pioneer in better shape than ever’. There’s no about that because when it was launched in late 2011, the B-Class really did bring something new to the compact class segment with good use of design and technology. The second generation of the Mercedes B-Class is also ambitious and will undoubtedly add to the 350,000 sales of this popular sports tourer in the years to come. To help sales, Mercedes has undertaken a major facelift with some minor exterior tweaks, improvements to the kit levels and an enhanced cabin that has a premium feel. There are also new engines; Mercedes have three frugal diesel units available with economy ranging from 57mpg to 79mpg. Alongside those are two efficient petrol engines which should return between 42 mpg and 52 mpg. And from next year, there will be the Mercedes B-Class Electric Drive model available too. So while the exterior tweaks have been kept to a minimum, the nose has a new bumper, a wide radiator grille and integral daytime running lamps have also been fitted. In the cabin, the instrument cluster has been redesigned and Mercedes have allowed owners to choose from 12 colours for the cabin’s ambient lighting to match their own mood. Among the options list is the firm’s Keyless-Go system which allows the driver to open and start the car just by carrying the electronic key. There are also a range of impressive safety features for the Mercedes B-Class including collision prevention assist which will apply the brake to help avoid the risk of a rear end collision. And there’s also an attention assist system to help keep the driver alert. The Mercedes B-Class also comes with the impressive ‘Connect me’ system which will call the emergency services in the event of an accident and also remind the driver of service and maintenance date and other issues. Available to buy now, the Mercedes B-Class will be delivered from November and prices start at £22,575 OTR for the entry level models. This entry was posted in Car Leasing, Car Updates & Releases, Cars, Family Car, New Cars and tagged B-Class, lease the Mercedes B-Class, mercedes, Mercedes B-Class by Steve Lumley. Bookmark the permalink.